The Nobel Prize–winning economist and best-selling author explains why saving Europe may mean abandoning the euro. When Nobel Prize–winning economist Joseph E. Stiglitz posed this question in the original edition of The Euro, he lent much-needed clarity to a global debate that continues to this day. The euro was supposed to unify Europe and promote prosperity; in fact, it has done just the opposite. To save the European project, the euro may have to be abandoned. 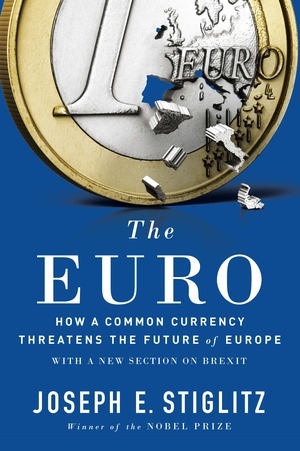 Since 2010, many of the 19 countries of Europe that share the euro currency—the eurozone—have been rocked by debt crises and mired in lasting stagnation, and the divergence between stronger and weaker economies has accelerated. In The Euro, Joseph E. Stiglitz explains precisely why the eurozone has performed so poorly, so different from the expectations at its launch: at the core of the failure is the structure of the eurozone itself, the rules by which it is governed. Stiglitz reveals three potential paths forward: drastic structural reforms, not of the individual countries, but of the eurozone; a well-managed dissolution of the euro; or a bold new system dubbed the “flexible euro.” With trenchant analysis—and brand new material on Brexit—The Euro is urgent and timely reading.